Thanks everyone for the comments, kind words and the heartfelt emails. I really appreciate it. Unfortunately this wasn’t the type of blogging break from which you return refreshed. Far from it. I’m sorry for being this cryptic but I don’t feel like writing about what happened in a blog post at the moment. I’m sure you understand. I’d like to apologize for skipping last month’s Literature and War Readalong. It was really not possible to read the book. I didn’t read much else either and I’m only slowly picking up books again. I’m looking forward to visit your blogs again and to write posts of my own. It will take my mind off things, I’m sure. Glad to see you back Caroline. I hope that all will be OK for you. Hi Brian, thanks. I’m better. Sending you good thoughts and many hugs. P.S. 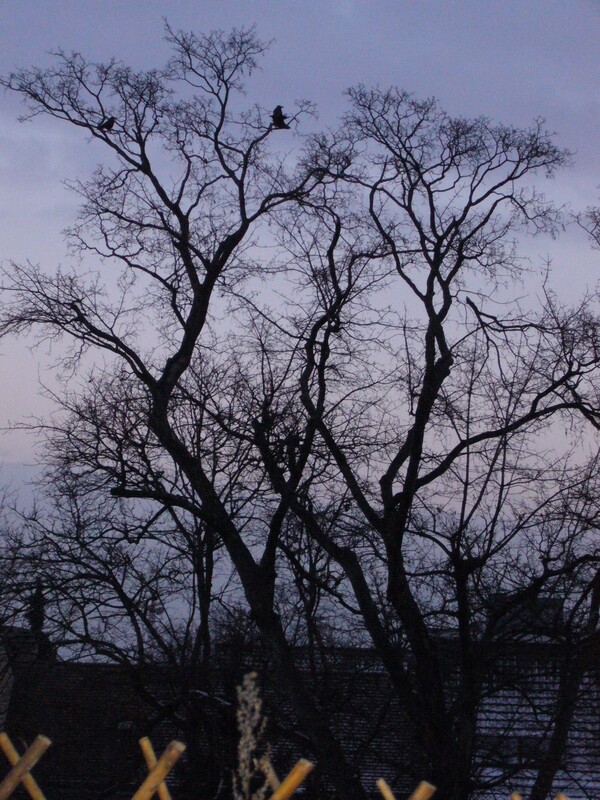 I love the pic, it reminds me of Poe’s raven…I’m in a Gothic mood these days. I took that picture last autumn but it reflects my mood. I’m a bit of a Goth anyway. Thanks, Jacqui. I’m much better. But it’s still sad and chaotic. Welcome back but I’m sorry you’re going through a hard time at the moment. As you say reading may help. I hope it does. Thanks, Caroline. Reading does help, at least it does now. At first it was not possible and Blunden was just too sad. Welcome back, Caroline–I hope you’re feeling better soon. Thanks, Richard, that’s kind of you. I hope so too. Welcome back, Caroline. Sending positive energy your way. That’s so kind of you, thanks, Jackie. No need to tell what happened ever, if that’s how you feel. It’s just good to have you back. Thanks, Lizzy, that’s nice of you. Thanks, Bellezza. It means something. As numerous others have said before me, welcome back, Caroline. I’m sorry that you’ve been having a hard time, and hope that things rapidly improve for you. You impress me as someone who deserves more than to suffer. Nice to see you back Caroline. Thank you, Guy. Can’t wait to see what you’ve been up to. You’re so nice, Victoria, thank you. I’m getting better. Nice to have you back, Caroline. Hope you are feeling better and hope everyday is better than the previous one and you are feeling better with each day. Thanks so much Vishy. It takes time but it’s getting better slowly. Hi Caroline–so glad to see you back–even if it is only in a sort of abbreviated manner! I hope everything is okay with you or that you are beginning to feel better! I had to pass by the last book for the readalong, too. I knew I couldn’t manage a NF book on the war just now but I have it and may tackle it some other time. Hope you find something comforting to read that will help get your mind off life and give you a little distraction and relaxation! Take care! Thanks, Danielle, that’s nice of you. Trench warfare was the last thing I wanted to and could read about. I’m reading Gail Carriger’s Changeless since I found Soulless last year such a hoot and it helps a bit. But at first I wasn’t able to read at all. Hope you back full strength soon. Difficulties only make us stronger in the end. Thanks, mel. It’s true, I know but you know how it is – in the middle of thinsg we don’t feel that way. Thanks, Carole. I realized that blogging might actually be therapeutic. Not at first, of course. Welcome back – hope you are well. Welcome back and I hope everything gets better soon. Thank you Emma, I hope so too. Thanks so much, Violet. It’s actually not that easy to find something light and fluffy that isn’t too silly. I got one of Tove Janson’s Mummins books. So sorry that you’ve been going through a tough time. I hope things are looking up for you now. Thank you, Anna. I’m doing much better. I am glad that you are again co-hosting the GLM this year. I sincerely wish that it means that things are picking up. Take care. Thanks, need. I’m better, yes.